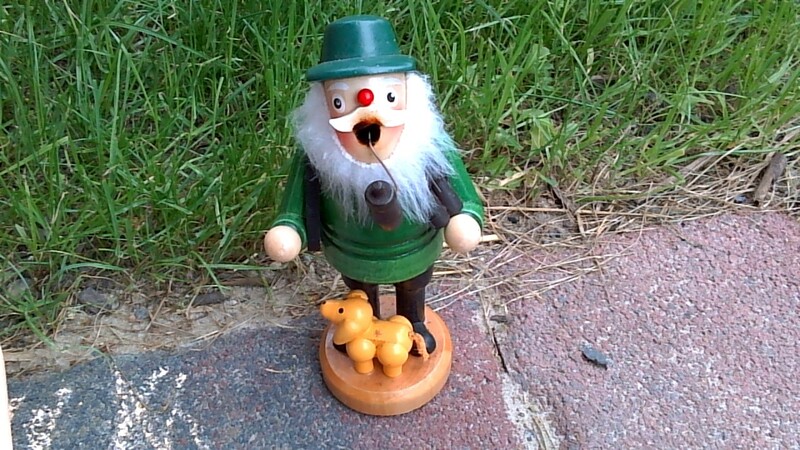 Iconia basic. 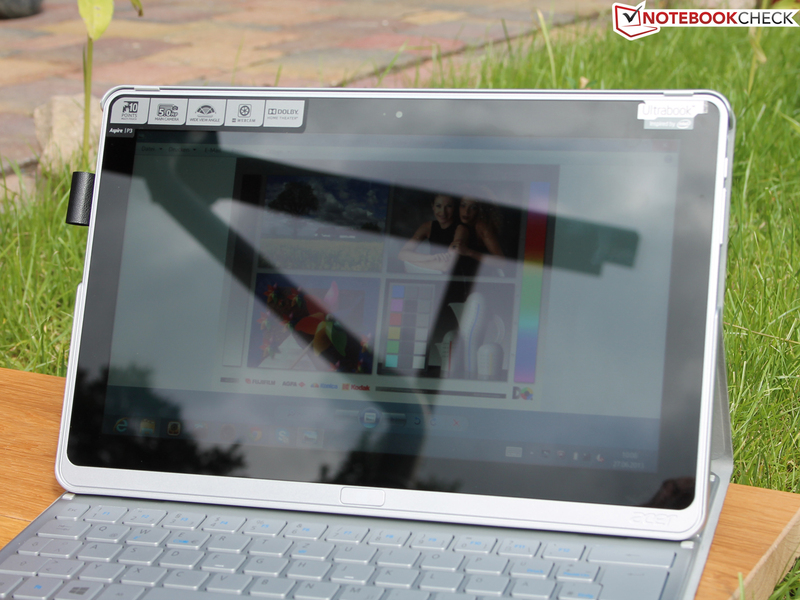 Windows alongside decent computing power packed in a quality aluminum tablet featuring a colorful and bright IPS screen. A keyboard-case combination is also included. There is barely a contender that can beat the current price of just below 600 Euros (~$769). Bargain alert? 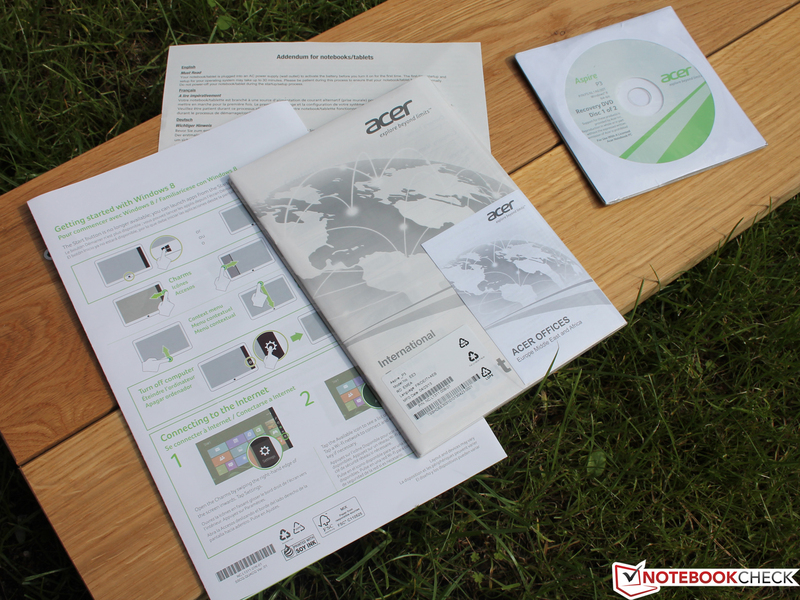 Acer Aspire P3-171-3322Y2G06as: The perfect fusion of tablet and subnotebook for Windows fans? 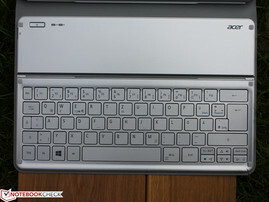 The Aspire P3-171 could be described as a slimmed down version of Acer's Iconia W700. After all, it is the same device from the outside and technically for the most part. The P3 offers "weaker" hardware for less money. At a price of just below 600 Euros (~$769), it sports an Ivy Bridge Core i3 alongside a 60 GB Intel SSD and an IPS with just 1366x768 pixels. It is a matter of course that a protective case with integrated chiclet keyboard is again included. The only significant difference, the Iconia W700 can apparently score with a Full HD screen (1920x1080). However, 50 Euros (~$64) more is charged for the lowest i3 configuration (i3-2365M). 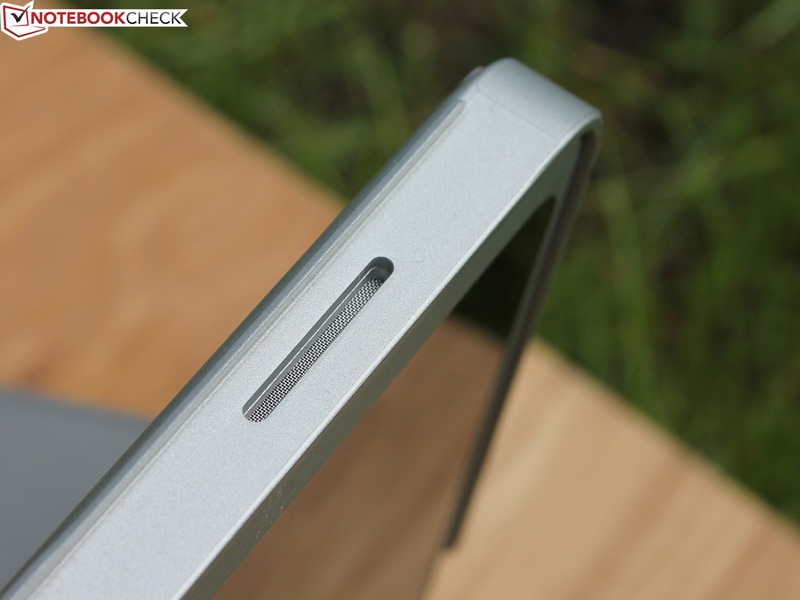 Find out which qualities the slimmed down IPS screen features in our in-depth review. 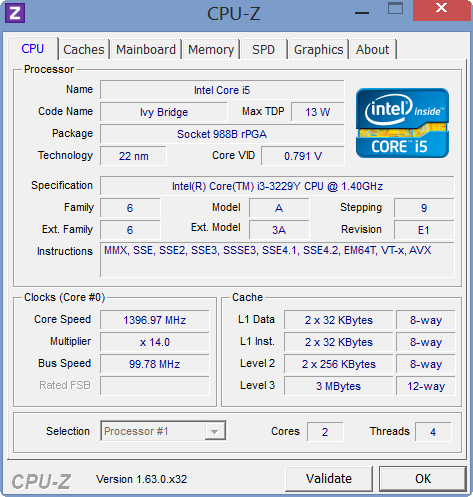 Is the performance difference of the Sandy Bridge i3-2365M to the Ivy Bridge i3-3229Y weighty? 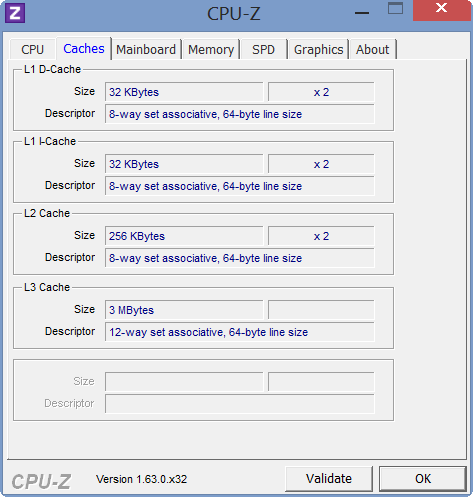 Both CPUs have 2 x 1.40 GHz each. Are there serious points of criticism? 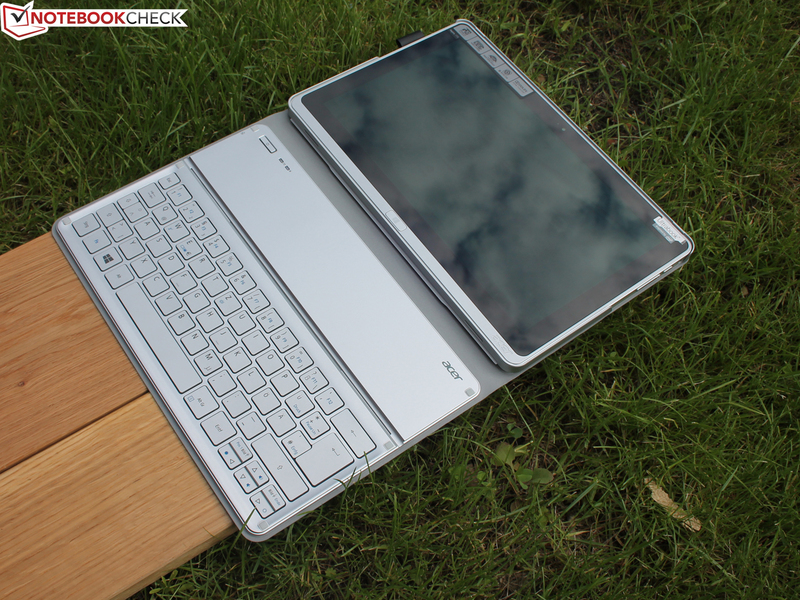 Or is the Aspire P3-171 a good deal for everyone who wants a swift Windows tablet alongside a hardware keyboard? 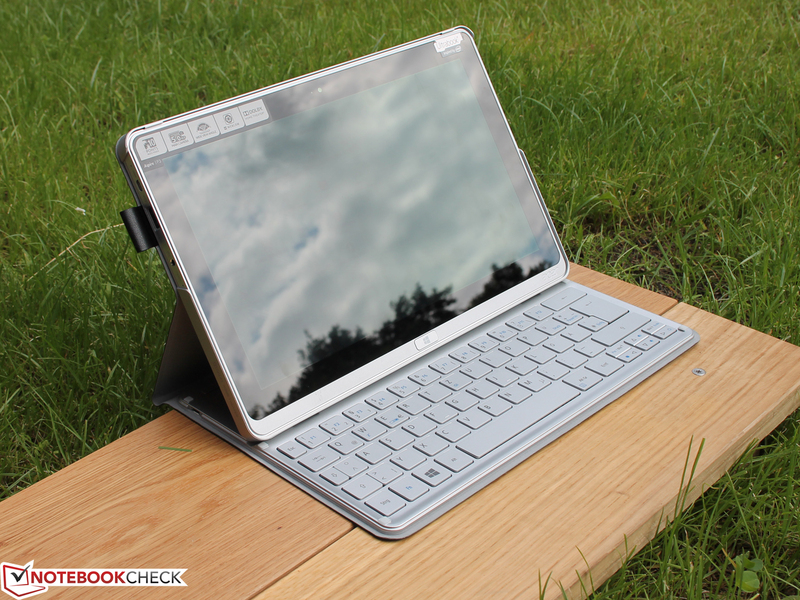 The 11.6-inch device is delivered in two parts, the Bluetooth keyboard (protective) case and the actual keyboard. 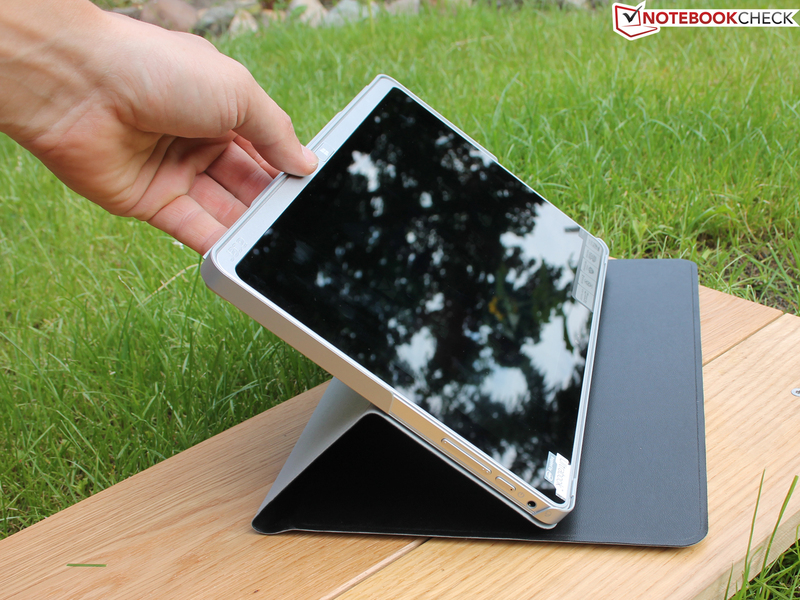 The base of the latter consists of a kind of aluminum tray that encloses the innards and the screen. We could actually call it an aluminum unibody. The anodized, matte finish prevents fingerprints and it has a non-slip feel. The screen's pane only yields under high force. Scratches were first noticed on the silver bezel and above the keyboard after only a few days of real use during a trip. The finish does not seem particularly resistant. 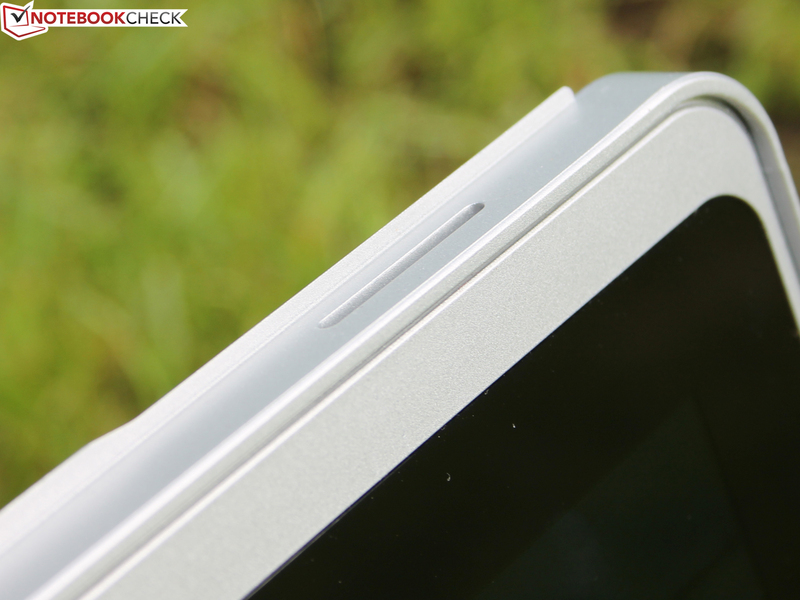 The keyboard case is inserted into the tablet via a plastic latch. It fits securely and recesses ensure air circulation. We took the following measurements with the keyboard case because it is basically a bundle. Users will unlikely remove the P3 from the case very often since the keyboard mode will be used most of the time. Besides that, taking it out requires using the fingernails to an extent. 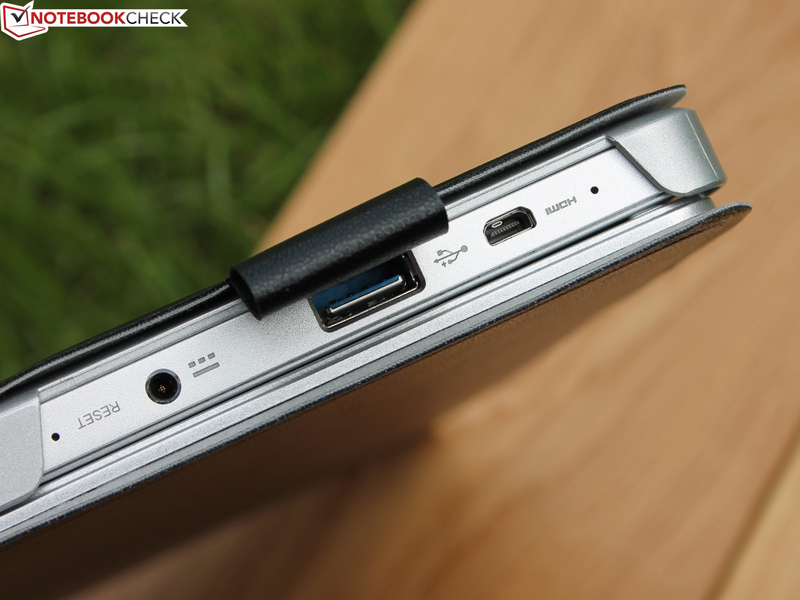 The laptop position locks securely because a wedge snaps into a narrow slot. Other positions are not possible. The screen rotates when held upside down but the tablet falls over. 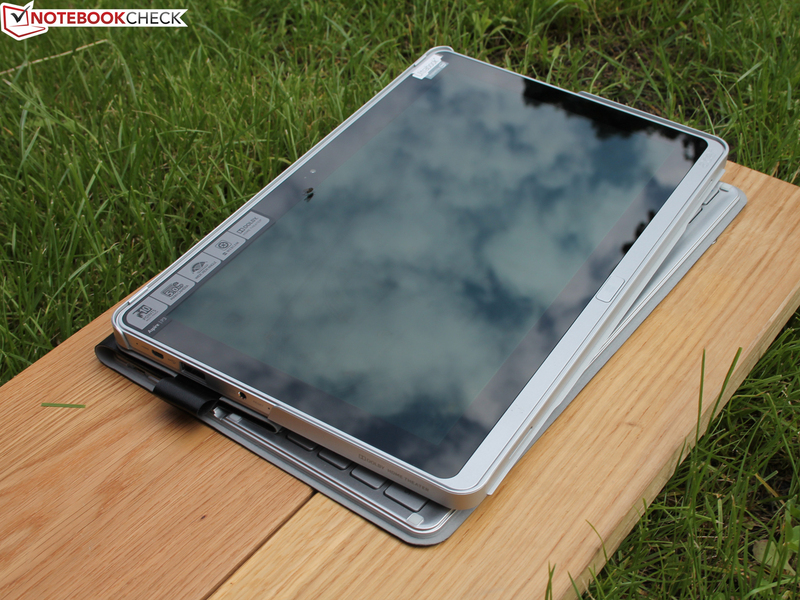 The Iconia W700 tablet (IPS 1920x1080 pixels) keyboard case is different. It is made of soft, transparent plastic like some smartphone sleeves. We are dealing with hard plastic in the present Aspire P3. The interfaces are no big surprise. They are the same as in the W700 but with a slightly different distribution. We criticized the lack of a second USB port and omitted card reader in the sister model. The tablet is not so thin that the omission could be justified. USB 3.0 and a micro-HDMI port are on the device's upper left. Users will have to look at unwieldy cables when an external TFT is connected. 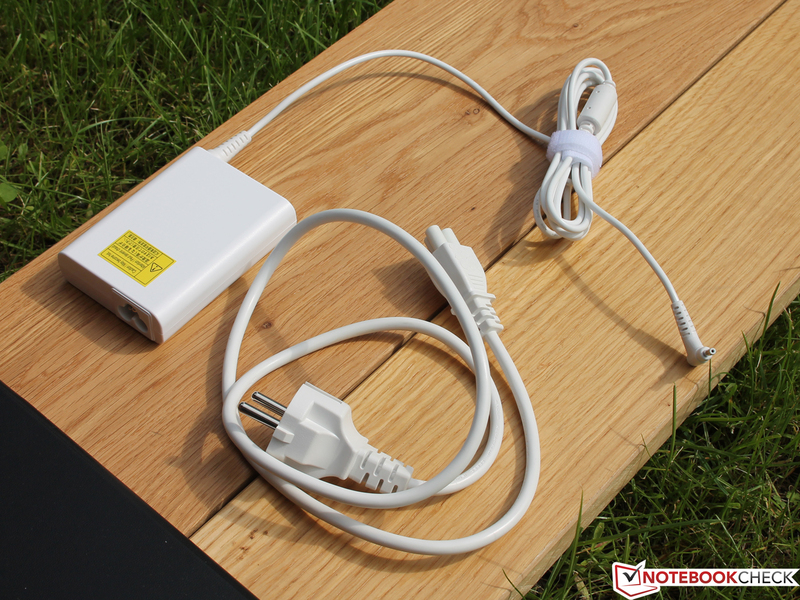 Heavy plugs and adapters also pull precariously at the small ports that could break after a certain time. 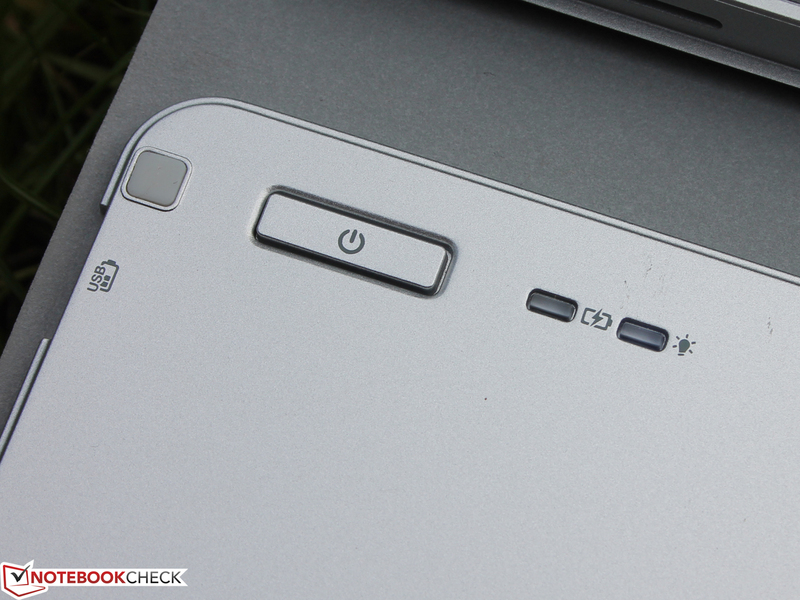 The P3 does not offer anything similar to the rotation lock switch found on the W700 (top left, by the air outlets). Qualcomm's Atheros AR5BMD22 Wireless adapter supports the extended 5 GHz band in addition to the 2.4 GHz band. That should rarely be needed but when the network is overloaded by many users, it is possible to fall back on it. We ascertained its range in a quick check in four positions in our office environment. 5 of 5 signal bars were displayed one story above the router (Fritz!Box at 50% transmission power). Four bars were still displayed at a distance of 15 meters (~49 feet), where we were outside of the building. We lost the signal permanently at a distance of 40 meters (~131 feet), at the furthermost corner of the property boundary. Some laptop contenders also fail at this distance, but many still have a weak connection. The Bluetooth module supports the 4.0 standard and can thus communicate with the keyboard economically. 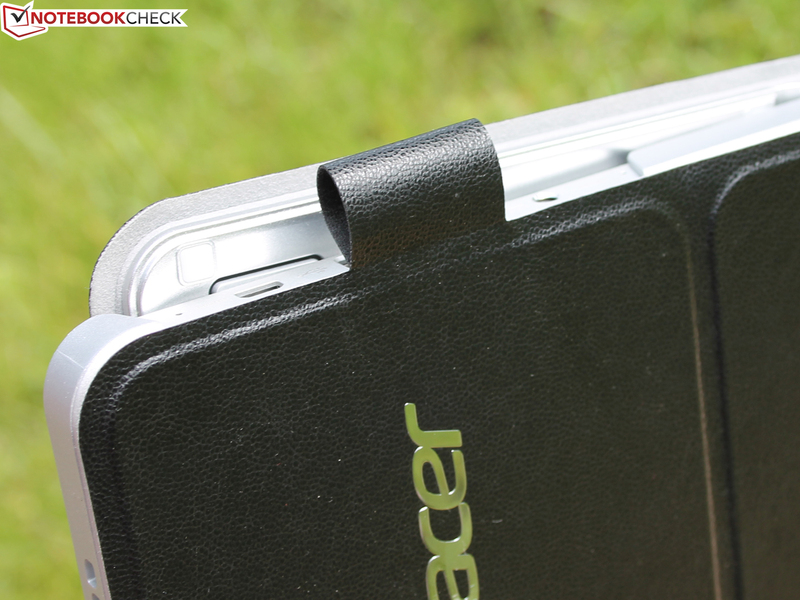 Acer always includes the keyboard case for the P3. The former is recharged via the USB 3.0 port and turned off and on via a switch. Regrettably, the device only features one USB port and is thus occupied when recharging the keyboard. However, a second recharge was not necessary during our test phase. Only the USB charging cord for the keyboard is included. 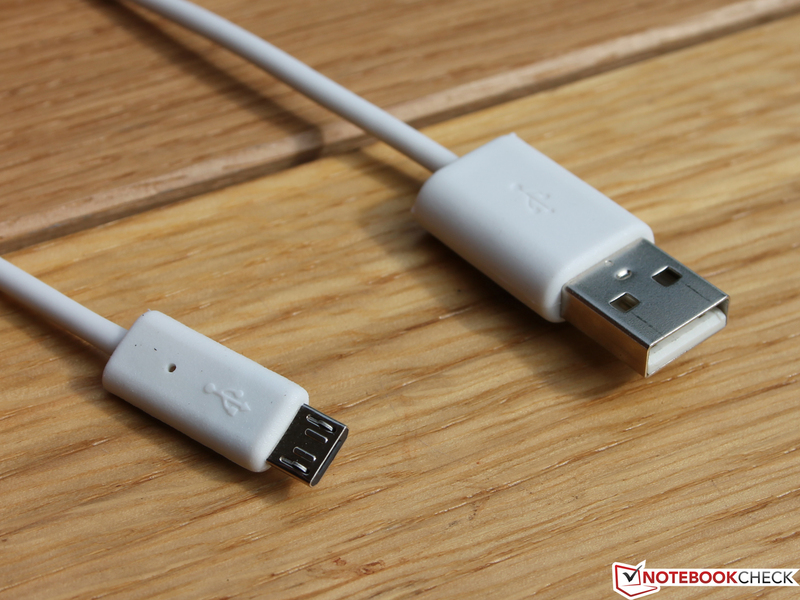 The user needs this unique cable due to a special, particularly flat USB used on the keyboard. 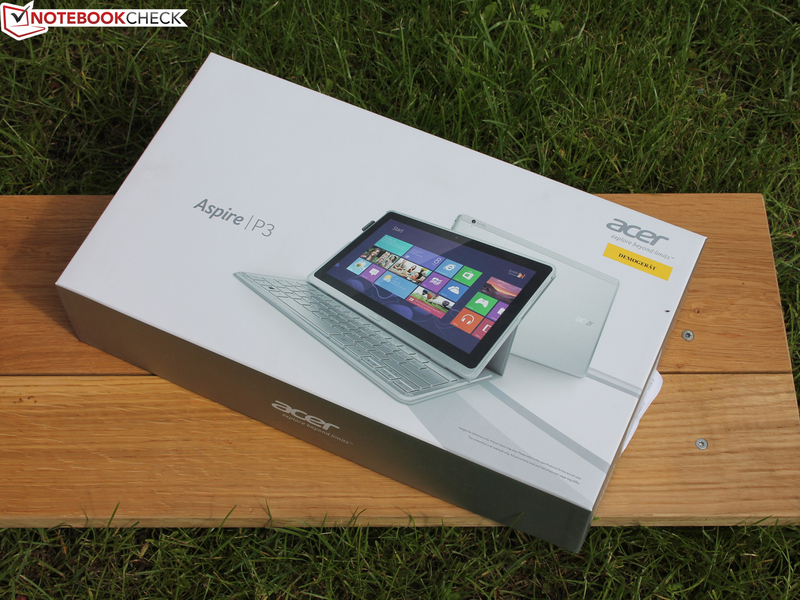 Acer delivers the Aspire P3 with Windows 8 64-bit. The box even contains recovery disks. The two Windows 8 recovery DVDs are a rare thing and manufacturers usually only include driver DVDs. The user does not need an optical drive for recovering the default settings. A hidden recovery partition with this data is on the SSD. The default settings can be restored via Windows PC settings. Acer installs Social Jogger (that unites the four major social networks in one view), Skype and proprietary webcam software so that the user can start communicating right away. 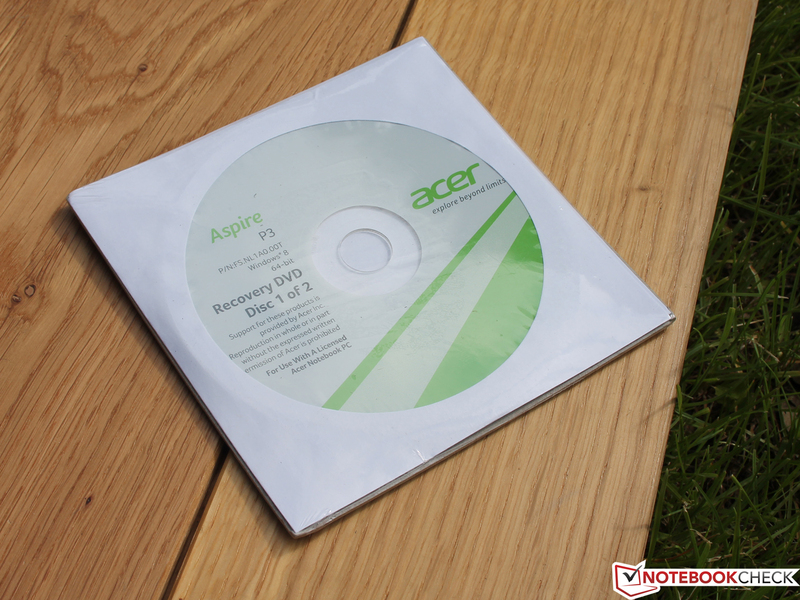 Acer includes a 24-month bring-in manufacturer warranty. Acer offers a range of warranty upgrades either over its own web shop or via diverse retailers (69 Euros/~$88 – 139 Euros/~$178). For example, 99 Euros (~$127) is demanded for the 3-year carry-in / 1-year International travelers warranty for tablets and ensures priority and free shipping. The front-facing camera is conceived for video calls only. 640x480 pixels simply do not allow more. 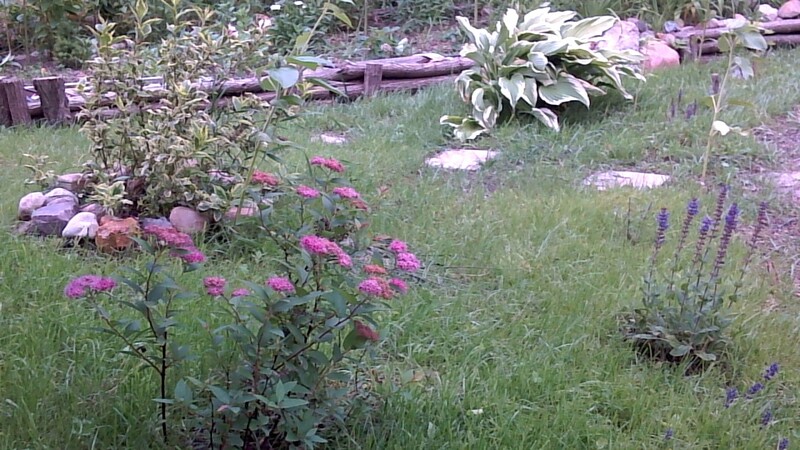 Colors look natural but surfaces are very blurry. The high-resolution, 5 MP camera on the back is different. It allows up to 2592x1944 pixels and the results are impressive. 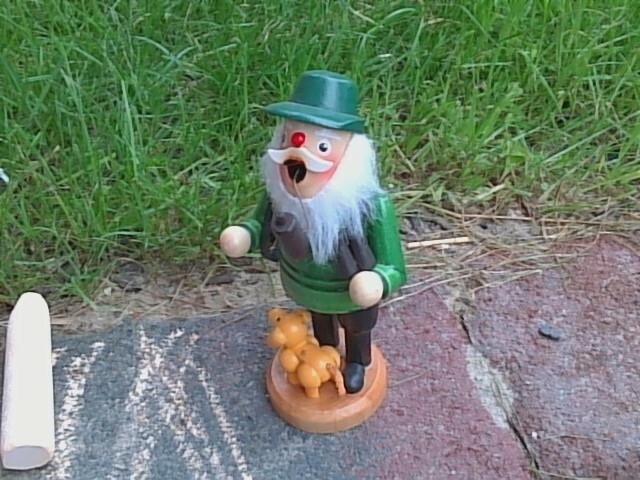 Its assets are a viable focus, detailed contours (even small details in the lawn) and natural colors. Acer however omits a flash. 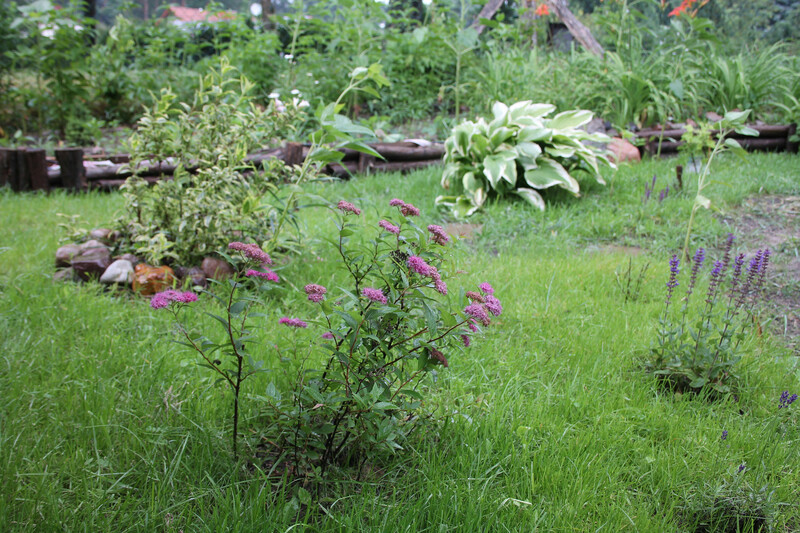 Of course, the small sensor cannot compete with an SLR (differentiation foreground and background EOS 1100D). The Bluetooth keyboard case is a handy gadget because the user always has a keyboard with real feedback at hand. That is the theory. The wireless connection was sometimes interrupted in practice (airplane = flight mode) and the short drop only gives an unsatisfactory feedback. This repeatedly leads to omitted characters. The keys feature a firm stroke and do not yield. 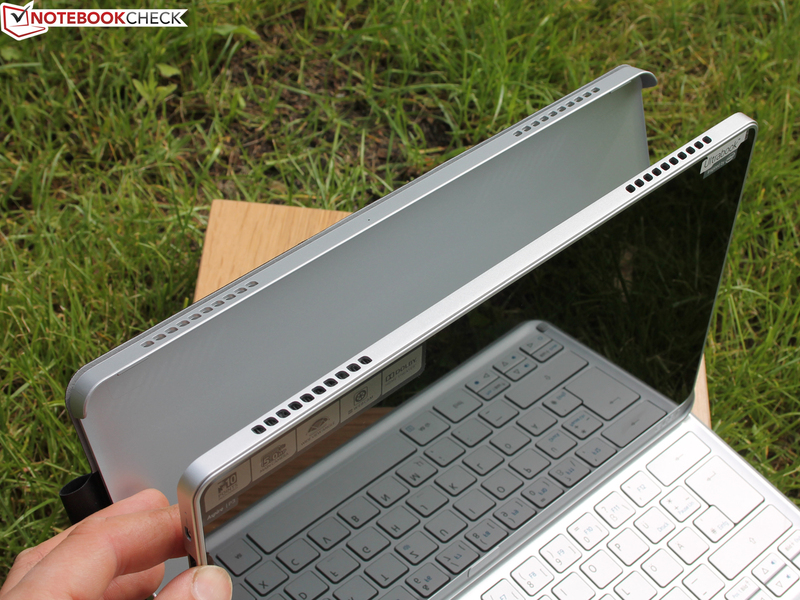 The surface only bends under high force when the device is placed on the lap and free space is created under the keyboard. We found the layout with its big keys, the wide enter and delete beside the arrow keys pleasant. The function keys are highlighted in blue as is common for Acer's devices. We can generally confirm that the keyboard, on which this text was written, has an acceptable but not a good feedback. It would be suitable for longer texts after some accommodation. This keyboard is no threat for business typing units, such as with HP's ProBooks or Lenovo's Edge models. The 10-finger multi-touchscreen is quite practical to use alongside the keyboard. We quickly got used to highlighting words with our finger or moving the cursor while we continued typing on the keys. The advantage is also obvious in shorter texts or quickly filling out forms: There is no virtual keyboard that obstructs the view. We found working with both input methods more practical and agreeable than on a 14 or 15-inch touch laptop due to the short distance for the hand. 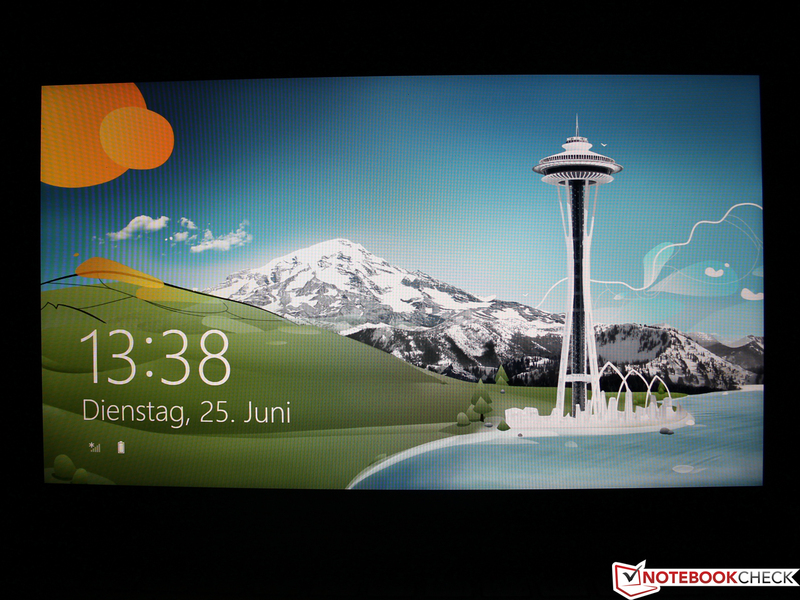 The 11.6-inch IPS screen's resolution of 1366x768 pixels is not as high as the W700 model that features Full HD. Acer does not offer an alternative resolution. Beyond that, the IPS screen's good qualities have been maintained. The 10-finger multi-touch B116XAT0 model from AUO is visibly reflective but has a very high average brightness of up to 400 cd/m². The illumination is very good despite the high brightness: 90% indicates a relatively homogeneously illuminated area, so no screen bleeding. The contrast is surprising. The black value measured in maximum brightness is so slight that we ascertained a contrast of 1580:1 (W700: 972:1). This lets colors look very crisp and fresh. 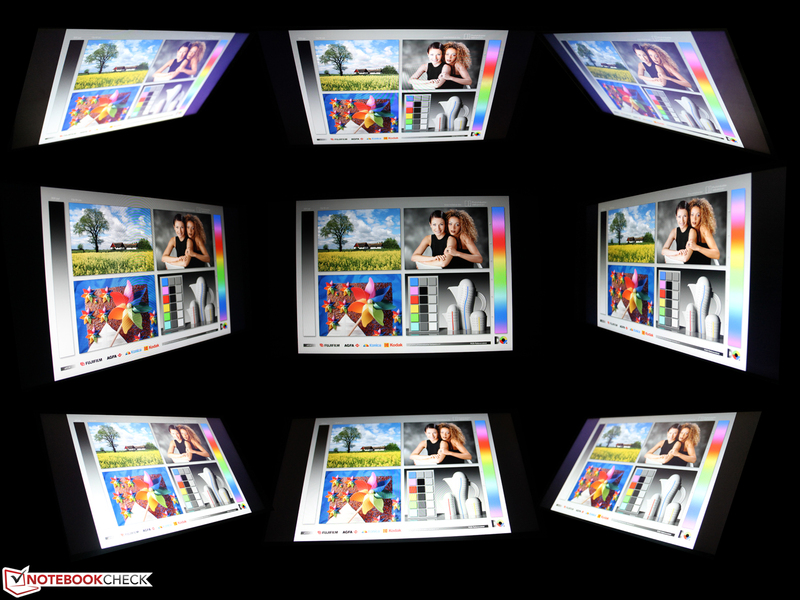 The screen cannot cater to professional needs, at least not when considering the standard sRGB and AdobeRGB gamuts. The screen is far from covering either space. However, this is the case for most contenders regardless whether an IPS or TN screen is used (Gigabyte U2142: TN TFT). The Iconia W700 has virtually the same small color spectrum. 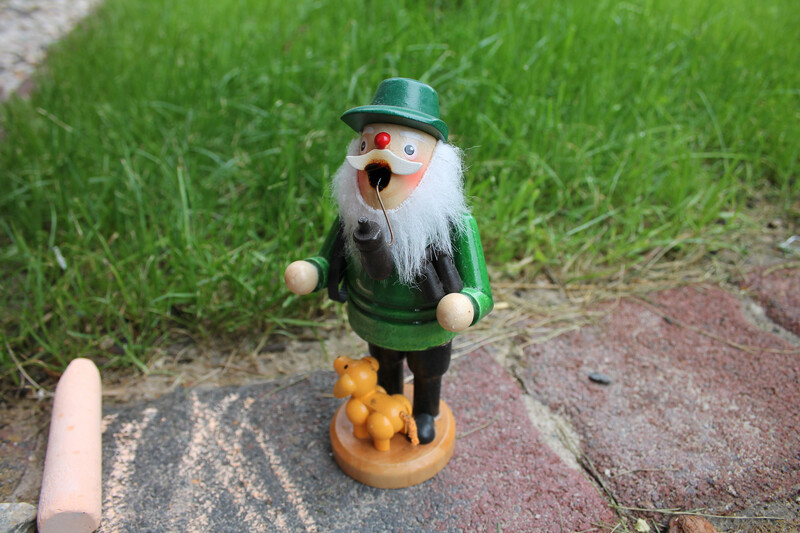 We performed a color analysis using the i1 Pro 2 spectrophotometer and CalMAN 5 software before calibrating. They both recorded good qualities in grayscale reproduction. Particularly the center hues are far below a DeltaE 2000 of 3. The screen does not have a bluish cast like so many laptops from this and higher price ranges. The screen's saturation shows that blue and cyan clearly deviate from the target spectrum of DeltaE 10 and 21. The W700 exhibited exactly the same deviation. 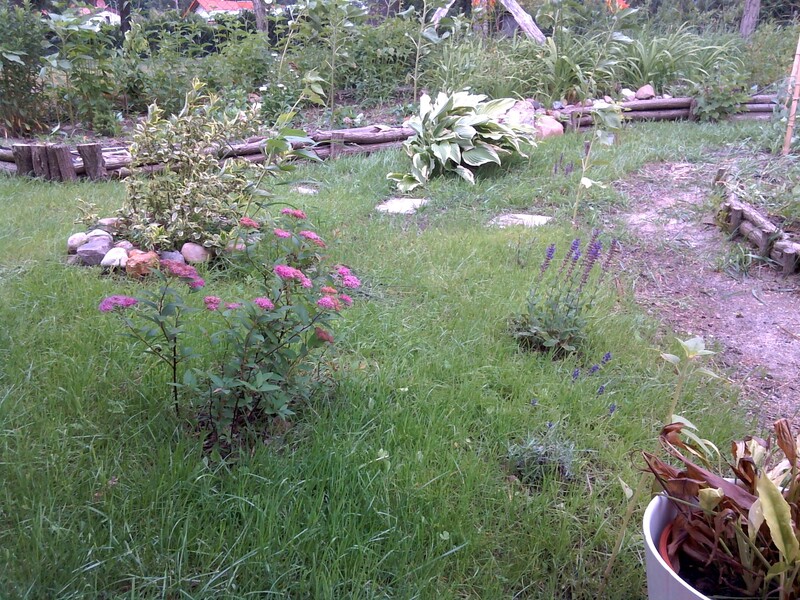 Since the high brightness is not reduced in battery mode, we experienced an acceptable picture on the desktop outdoors. However, we often struggled with the viewing angles due to the intense reflections because the backgrounds were strongly mirrored. We exposed the ambient light sensor with a lamp to ascertain the maximum brightness. This sensor ensures that the TFT brightness is automatically adapted to the surroundings. Thus, the screen is set to maximum brightness is bright sunlight. Users will be prevented from using the full brightness indoors because the sensor determines the upper limit. We therefore constantly exposed the sensor and set the brightness as close to 150 cd/m² as possible (Wi-Fi test) for the battery tests where the brightness settings are predefined. The viewing angle stability is a typical asset of IPS screens and this one is no exception. Like good smartphones, we can look at the screen from slanted positions. Contours stay defined and colors do not fade. The picture first fades at very acute angles of almost 90 degrees. The W700 has the same quality. 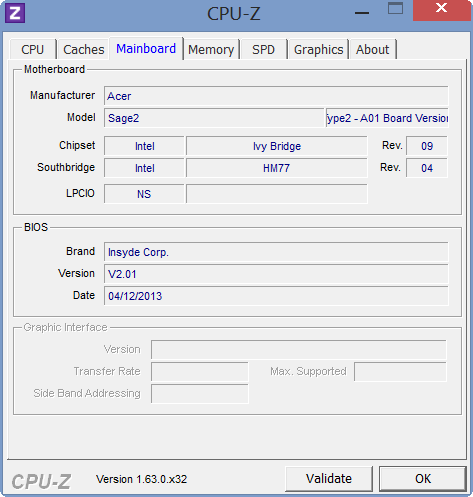 Acer trusts Intel and installs a Core i3-3229Y with 2x 1.40 GHz. The low-voltage core comes with its own Intel HD Graphics 4000 (IGP) and memory controller. The lack of Turbo Boost but present hyperthreading that processes four threads at the same time is typical for the i3. The 3229Y's TDP of only 13 Watts fits better to tablets than other Ivy Bridge models with standard 17 Watts. We wonder whether Acer has reduced the TDP by another 10 Watts in order to achieve longer runtimes with the 5280 mAh battery (cTDP down). Since we do not have a comparison device with the same CPU, we can only guess and say no due to the good performance scores. Acer also offers the P3-171 with a Core i5-3339Y (2x 1.50 GHz) that is bundled with a 120 GB SSD and is otherwise identical. Our review sample only sports a 60 GB SSD inserted as mSATA. Only approximately 25 GB are unused in state of delivery. It cannot be expanded since there is no SD card slot. Is the performance difference between the Core i3-2365M (Sandy Bridge, HD Graphics 3000) and i3-3229Y (Ivy Bridge) significant? 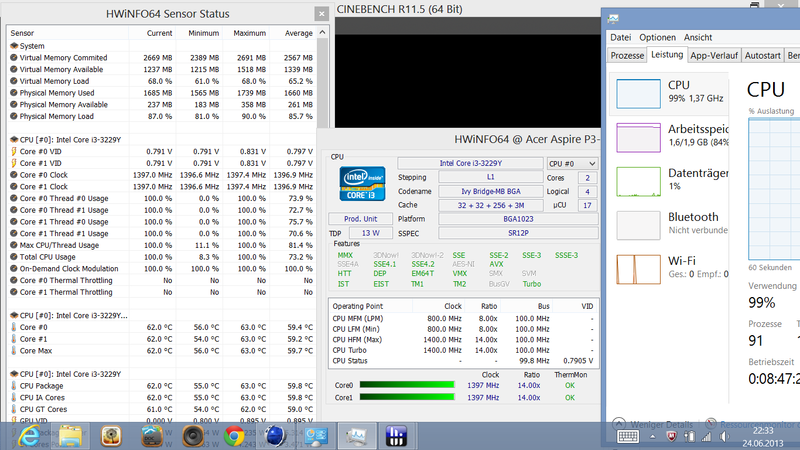 Both CPUs clock with 2x 1.40 GHz but the now installed 22 nm CPU is more energy-efficient. 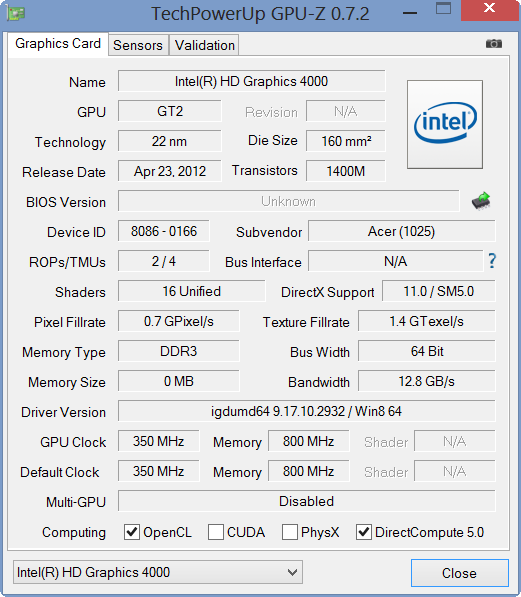 It also sports a newer version of the integrated graphics (HD 4000). Looking at comparisons to the tested Iconia W700-53334G12as show that this does not make much sense in terms of price. 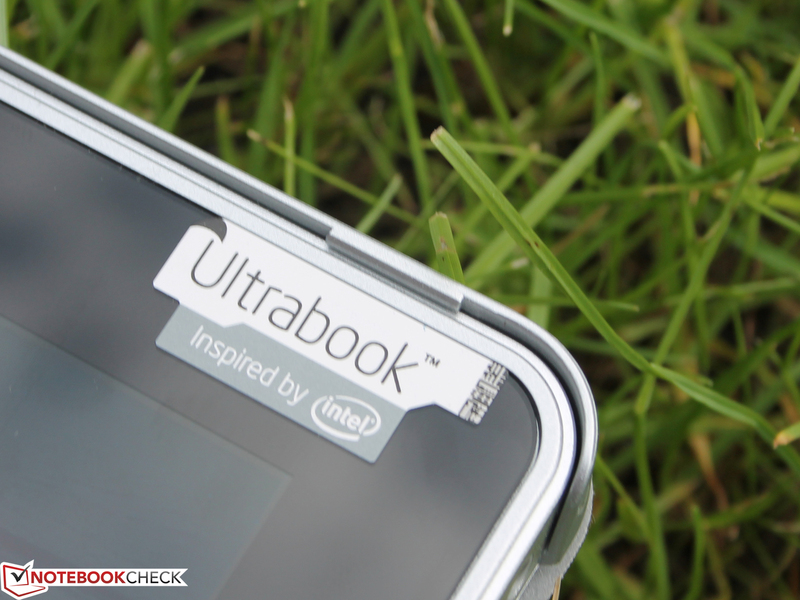 We reviewed the expensive i5-3337U version (1.8 GHz, HD 4000, Ivy Bridge, price around 800 Euros (~$1025)). 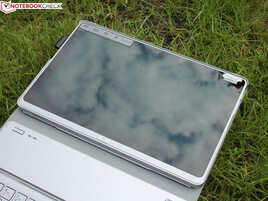 Therefore we used Lenovo's IdeaPad S300 for comparison, which sports the corresponding i3-2365M. However, only the CPU benchmarks are comparable due to its installed AMD Radeon HD 7450M. 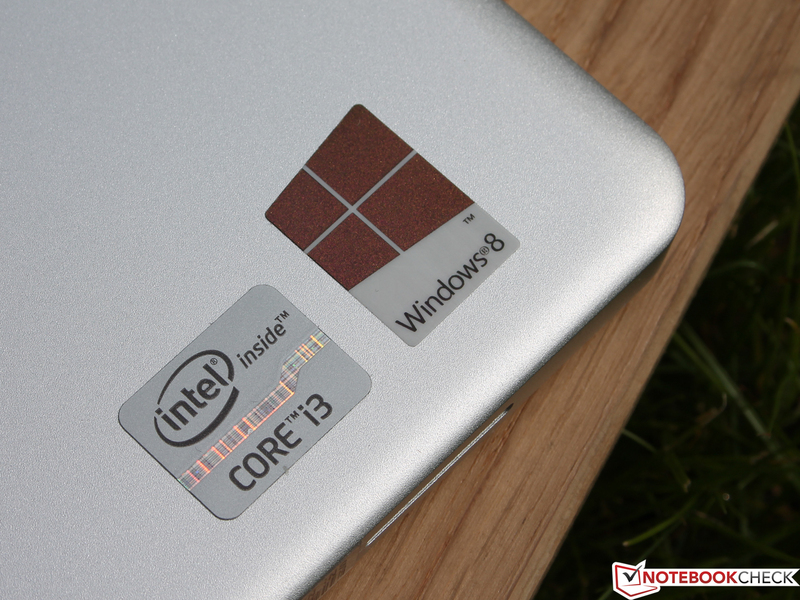 We cannot make a direct comparison with the Core i5-3339Y due to the lack of test results (IdeaPad Yoga 11s). 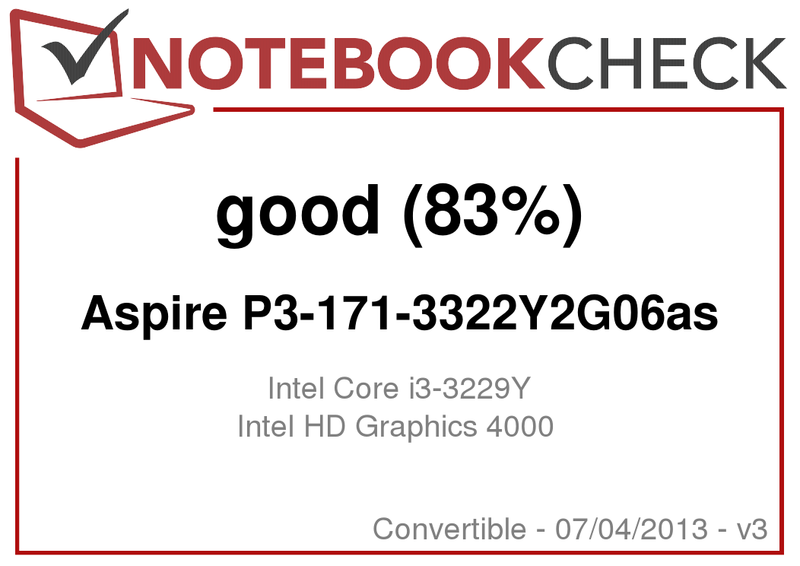 The Core i3-2365M in the IdeaPad S300 performs the Cinebench R11.5 multi-test 29% faster than our Core i3. This difference is similar in other CPU benchmarks (approx. +25%). 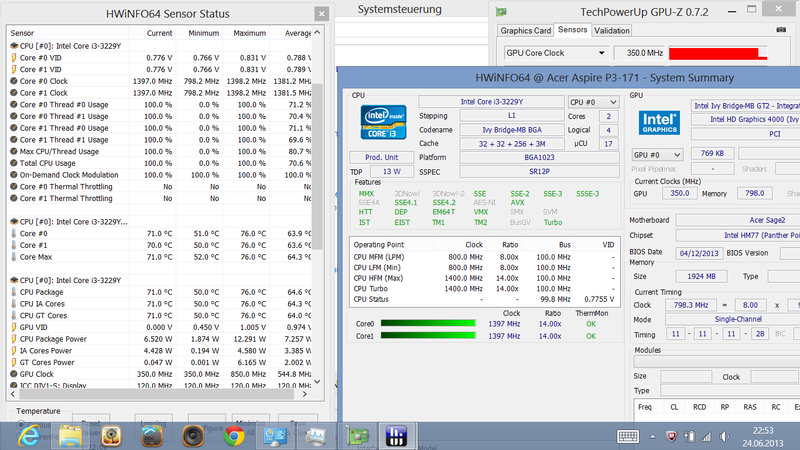 The expensive W700 with a Core i5 achieves +110%. 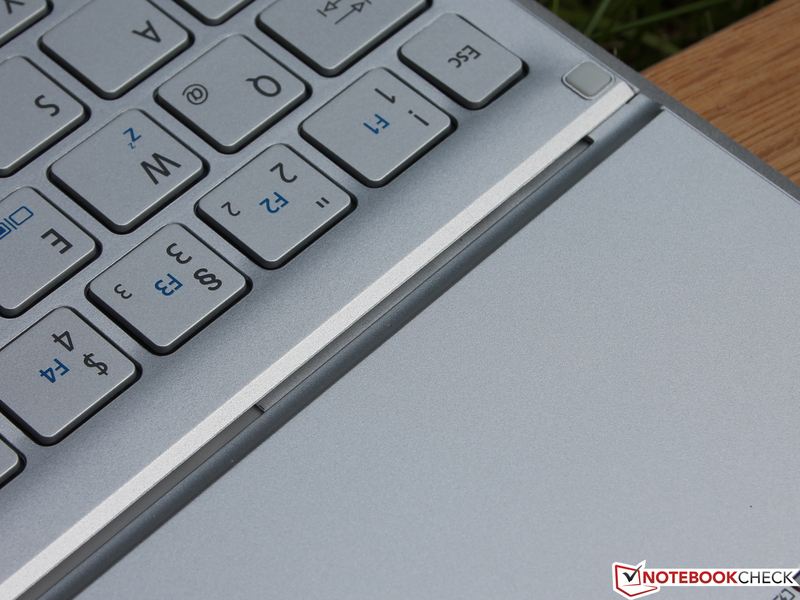 A look at Acer's Aspire V5-122P subnotebook is interesting. The A6-1450 low-voltage quad-core was specially developed for multi-tasking in small devices and processes on the same level. The default clock of 1.4 GHz was constant during the tests. 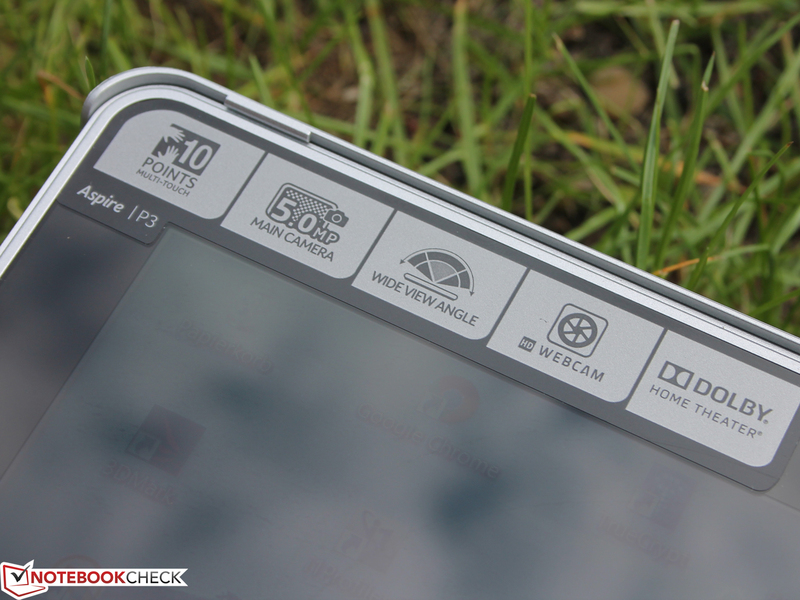 The scores in all R11.5 tests were constant in battery mode (high-performance setting). This is also true for the HD 4000 that maxes out its Turbo of 850 MHz (GPU energy-saving disabled!). 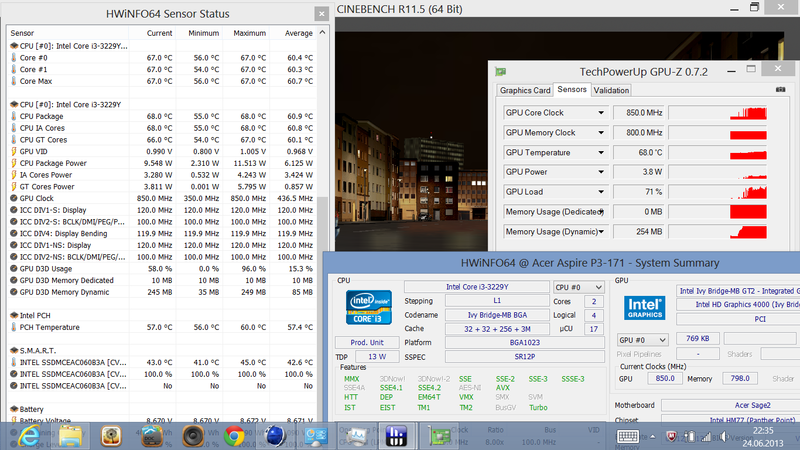 Cinebench R10 illustrates the major difference to Intel's Atom Z2760 (-48%) that powers many Windows 8 tablets (e.g. Asus' VivoTab TF810C). Thus, Windows users are on the safe side with the Core i3. 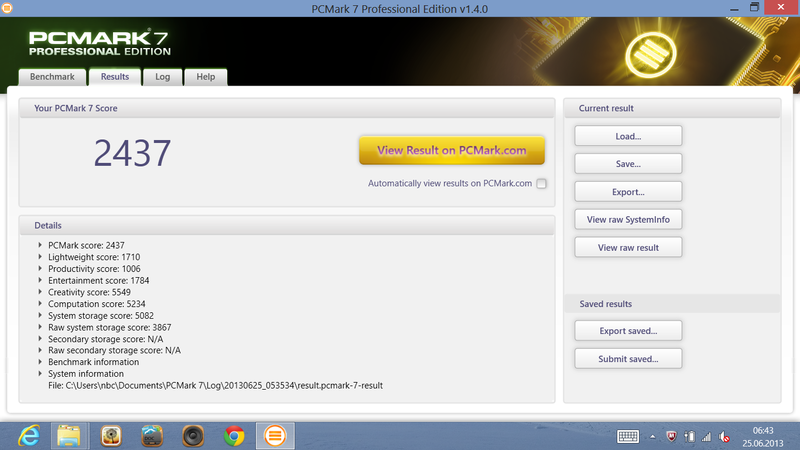 The system benchmarks, which are exemplary for PCMark 7 in the chart, deliver astonishingly strong, though not perfect scores. The A6-1450 in Acer's Aspire V5-122P only manages half the points and the i5-3337U in the W700 achieves 77% more. The system benchmarks benefit from the high system storage score and HDD score. Owing to its Intel SSD, the P3 can outperform the hard disk in the V5-122P and can almost keep up with higher quality SSDs installed in some ultrabooks. Samsung's SSD PM830 in Dell's XPS 13 L322X, for example, only achieves 33% more points in the PCMark 7 system storage score. The subjective work speed convinces us. The tablet boots in no time from a cold start and programs open swiftly. 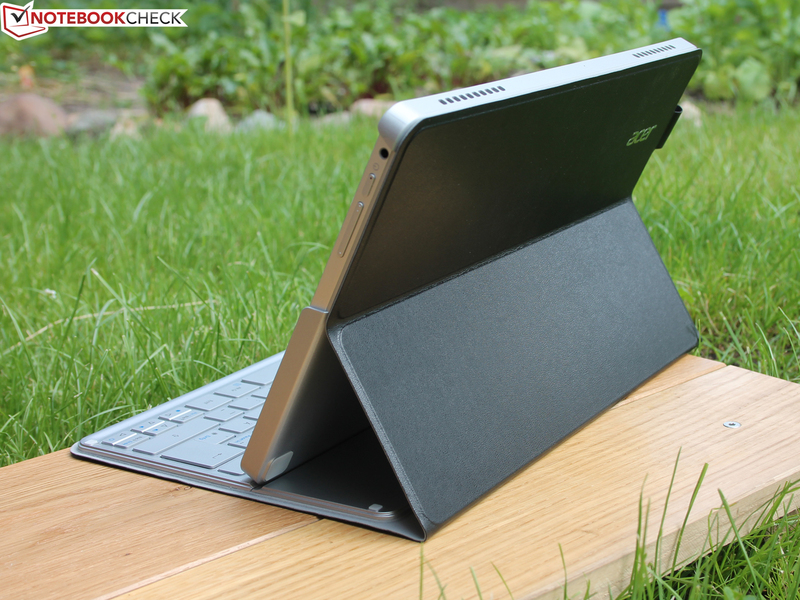 The performance is miles ahead of Intel Atom tablets (standard Windows 8) both in measured rates and subjective impression (Asus VivoTab TF810C: -39%). The details of the SSD assessment reveal its strengths as well as its (few) weaknesses. With high 388 MB/s in the read test, Intel's mSATA module can read almost as fast as SSDs in full-blown and expensive ultrabooks. Samsung's SSD PM830 256 in Dell's XPS 13 is 20% faster. A look at the Read 4K shows that the 60 GB SSD is sometimes faster than the premium models in reading small random files. Compared with Toshiba's THNSNS128GMCP in the W700, Intel even tops it by 47%. 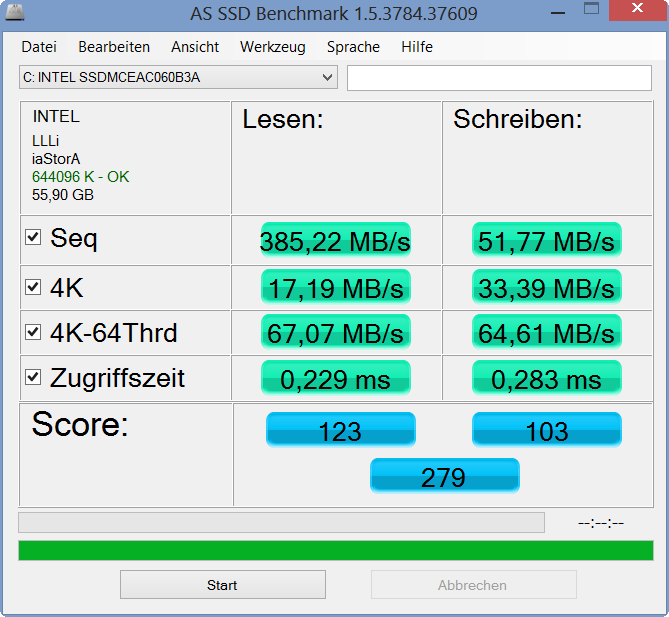 When considering that the installed Intel 525 Series SSDMCEAC060B3A is connected to SATA 3.x (6 GBit/s), those rates are high but not remarkable. 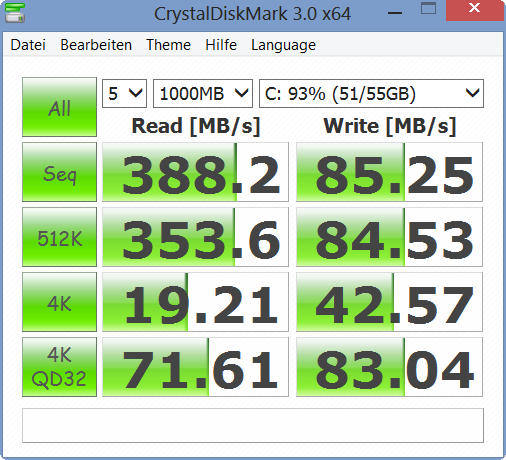 We have had SSDs with 30 MB/s in the 4K read test. We have to note that Acer could change to another SSD model without warning so this swift model is not guaranteed. The Core i3's HD 4000 clocks with up to 850 MHz in Turbo, which the FurMark GPU test confirms exactly. The measured rates are 27% (W700, dual-channel) to 85% (Dell XPS 13, dual-channel) below the comparison devices due to the lower clock rate and single-channel bus. Even Acer's Aspire V5-122P with its Radeon HD 8250 does not achieve a much higher score in the Cinebench R11.5 OpenGL test. The 3D benchmarks roughly show the same picture: HD 4000 systems with a higher Turbo and dual-channel manage 70 to 100% more points. Is playing games possible on the P3? A clear no, because the action is very jerky. Even undemanding games like FIFA 13 do not run smoothly in medium settings. The 11.6-incher sports a small fan (active cooling) that runs constantly and does not even stop during long idle periods. The noise of 30.5 dB(A) is audible but did not distract us seeing that it was quieter than other noise sources caused by normal office noises. The P3 did not overdo it during the stress test where we only measured up to 37 dB(A). Medium load, like in 3DMark 2006, only resulted in 34 dB(A). One opening in the casing takes in cooling air and another discharges the waste heat. Despite its consistently running fan, the casing clearly heated up to a lukewarm 35 °C (95 °F) on the top and 32 degrees (89.6 °F) on the bottom when idling. We measured the P3's waste heat while it was in its cover since this will likely be the usual scenario. The tablet’s hot spot was at the top on both sides of the webcam. The processor is probably located here. We measured up to 49 degrees Celsius (120.2 °F) during constant maximum load. The W700 managed much lower waste heat temperatures in both scenarios with the same noise level (max 41 degrees (105.8 °F) bottom @ stress test). 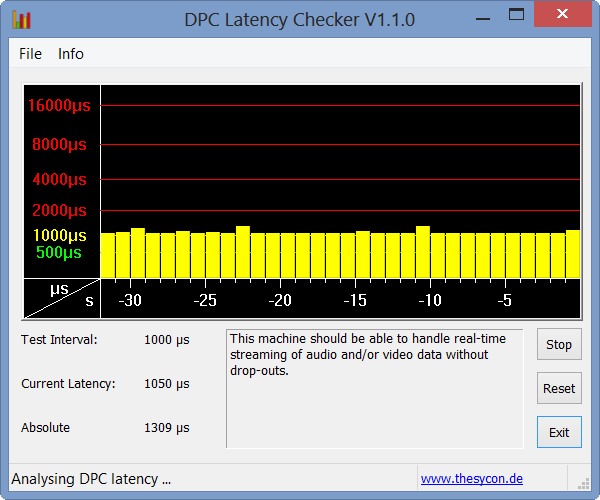 The HD 4000 consistently clocked with its 850 MHz when the CPU and GPU cores were put under constantly high load. The CPU marginally throttled to 1.3 GHz. 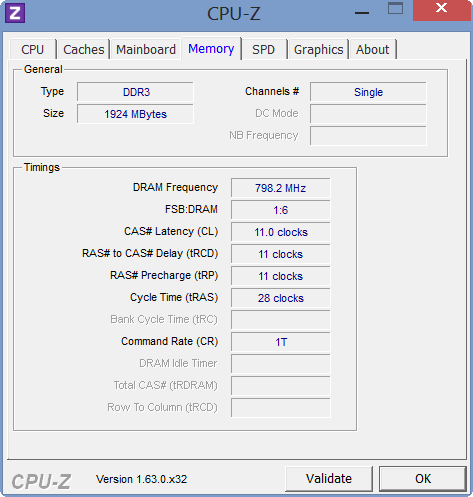 As soon as FurMark was stopped, the clock again climbed to its standard clock of 1.4 GHz. The processor does not feature Turbo. (±) The average temperature for the upper side under maximal load is 37.9 °C / 100 F, compared to the average of 30.3 °C / 87 F for the devices in the class Convertible. (-) The maximum temperature on the upper side is 48.9 °C / 120 F, compared to the average of 35.4 °C / 96 F, ranging from 21.8 to 55.7 °C for the class Convertible. (±) In idle usage, the average temperature for the upper side is 34.8 °C / 95 F, compared to the device average of 30.3 °C / 87 F.
(±) The palmrests and touchpad can get very hot to the touch with a maximum of 36.6 °C / 97.9 F.
(-) The average temperature of the palmrest area of similar devices was 29 °C / 84.2 F (-7.6 °C / -13.7 F). 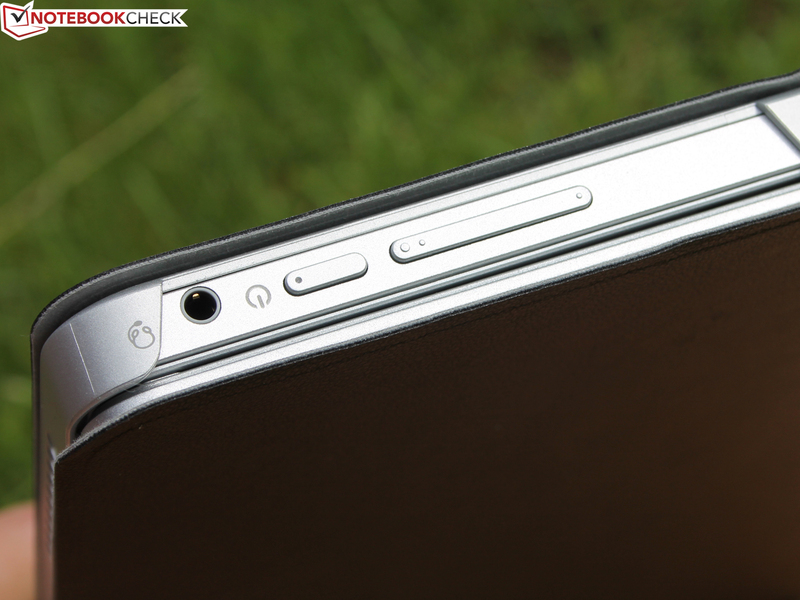 The small stereo speakers are located on the tablets lower edge. They discharge the sound toward the keyboard in keyboard mode. That is intentional because a bit of volume is lost when the sound does not reflect on the surface and the sound gets thinner, e.g. when carrying the tablet. We noticed a light scratching at maximum volume. However, this level is unnecessary because music is more than sufficiently loud at 50% for the desk. There is no audible bass due to the lack of a sound box. Differentiated trebles are not possible for the midrange-heavy speakers. The 65 Watt power supply seems very oversized for the power consumption of just 25 Watts during load. There are enough reserves, which the stress test's low waste heat of only 43 degrees (109.4 °F) confirms. 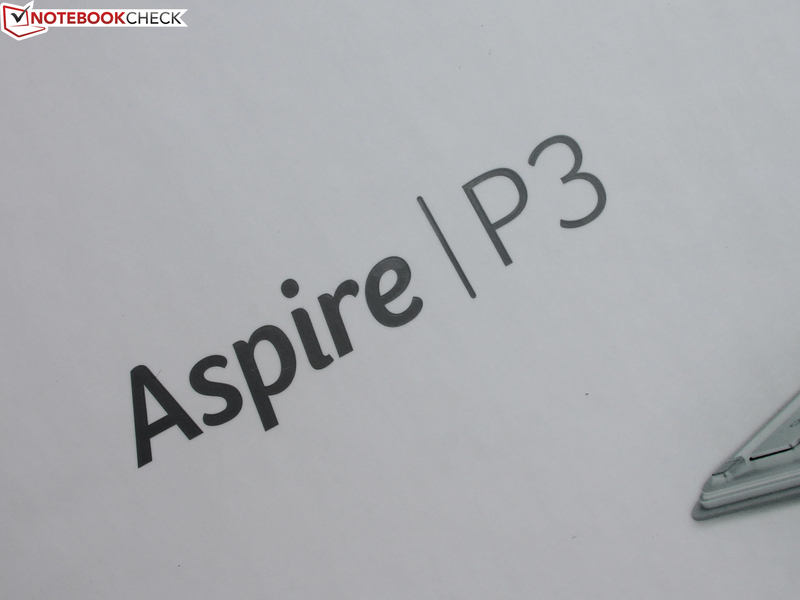 Nevertheless, the activated Aspire P3 needs a whole three and a half hours for recharging the battery. The Iconia W700 has a somewhat higher stress power consumption of 28 Watts, but the medium (21 W) and idle (5.6 - 7.4 W) consumption rates are much lower than that of the P3. This is also a reason for the shorter runtimes despite the roughly same battery capacity of 5280 mAh (W700: 4850 mAh). 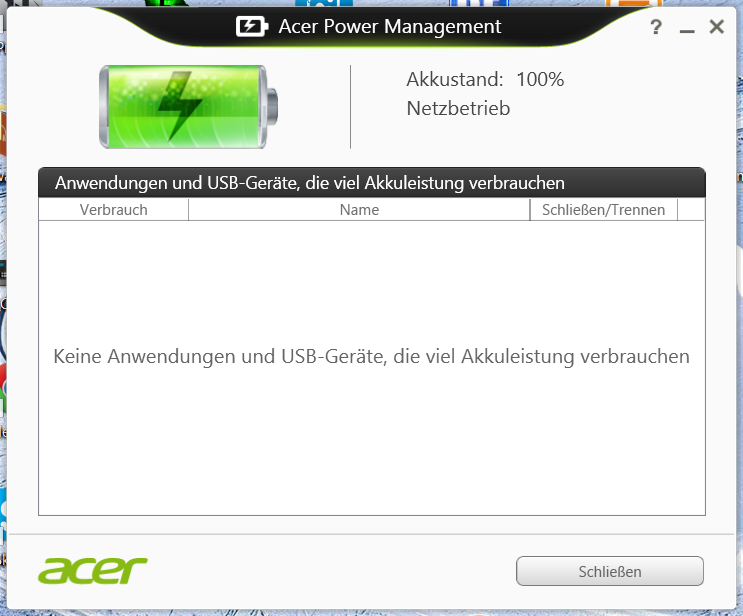 The Acer Power Manager proves to be a superfluous tool. It does not enable accessing certain hardware features, e.g. webcam off, USB off, limit clock rate, brightness sensor, etc., but only displays applications and USB devices that consume a lot of power. The loose fit of the keyboard's bottom part annoyed us a bit when the P3 was closed. It often slipped and did not completely cover the TFT. The 5280 mAh battery lasted for a good three hours in Wi-Fi mode and high brightness (real use on a trip). Our standard Wi-Fi test however finished after 4:41 hours. The brightness was set to 150 cd/m² (sensor exposed to light) and a browser script opened websites (some videos) every 40 seconds. The runtime decreased to only 2:54 hours during load. The CPU is constantly working, the high-performance profile is selected and the brightness is set to maximum (sensor disabled) in this test via Battery Eater Classic. The low TDP of 13 Watts is noticed here. The Iconia W700 achieved idle runtimes of up to 11 hours (minimum power consumption) and 6:33 hours in the Wi-Fi test. 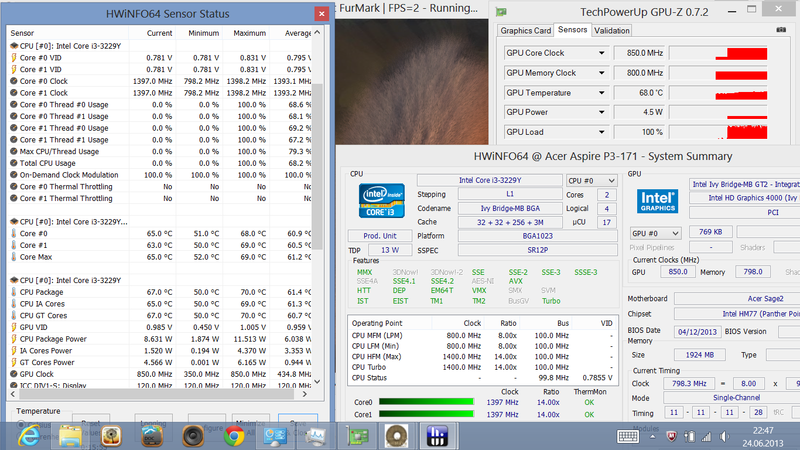 The P3 (i3) and W700 (i5) are approximately on a par in load with 3 hours. The P3 tries to live up to the earlier success of the Iconia W700 model and lures with a low price design. The 11.6-inch tablet only makes a few mistakes. The i3 performance alongside the swift Intel SSD bears fruits. Common Windows tasks like Excel, Outlook, copying or even basic image editing are performed quickly. It is only too bad that only 25 GB of the 64 GB SSD (net: 59 GB) is available for storage and installations. There is no card reader for expanding it via an SD card. Working is fun on the contrast-rich and viewing-angle-stable screen although HD+ would have been the better choice for productive use. However, productivity under Windows is not long lasting. The battery is drained after only 3 - 3:30 hours of undemanding operation and the joy of a real keyboard dissolves more and more due to the short drop after longer use. 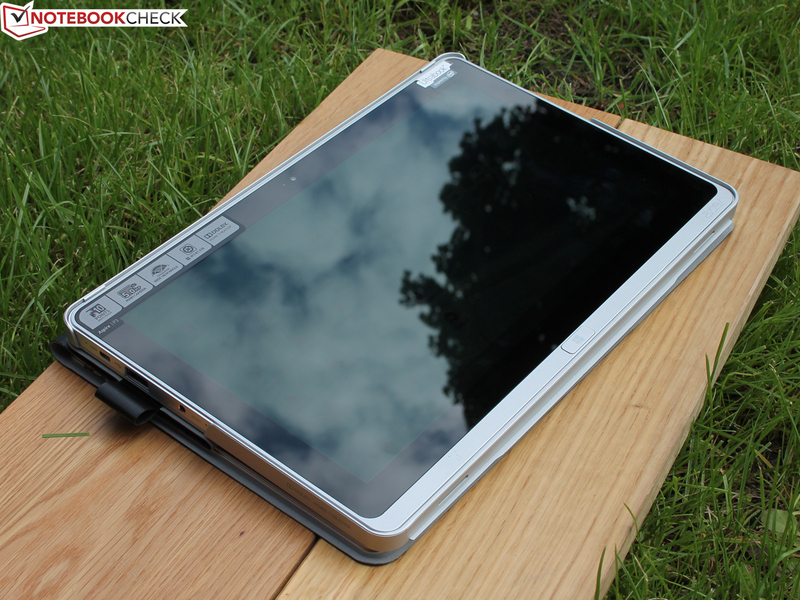 We deem the Aspire P3-171 to be a suitable companion for everyone looking for a laptop and a tablet in one device. However, homebound laptop use will be the rule. The buyer should not be a gaming fan and not planning to save masses of movies or pictures on the tablet. He or she should rather take delight in a handy device with a great screen. The good application performance makes the P3 future-proof for the next few years. Another laptop in addition to the tablet is actually unnecessary. 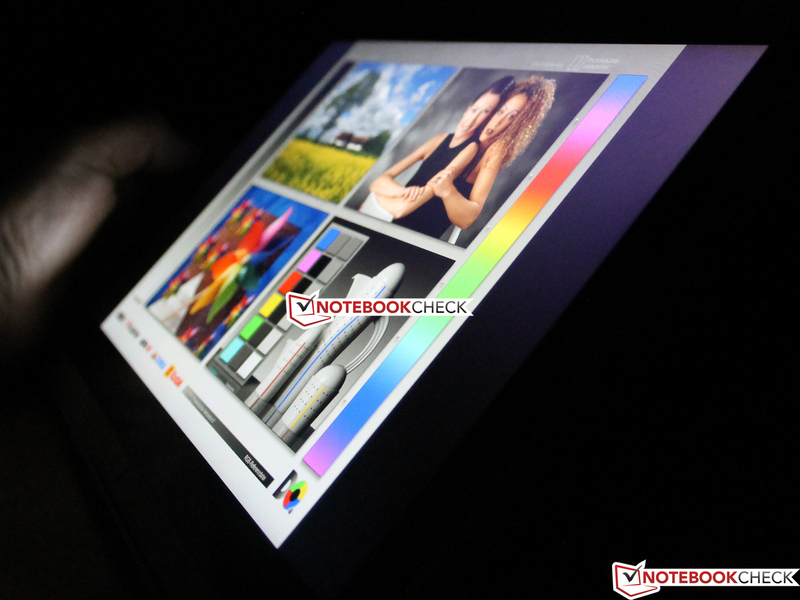 However, users who want a perfect ultrabook in tablet format, in every sense, should look at the Iconia W700, Microsoft Surface Pro and Sony Vaio Duo 11. 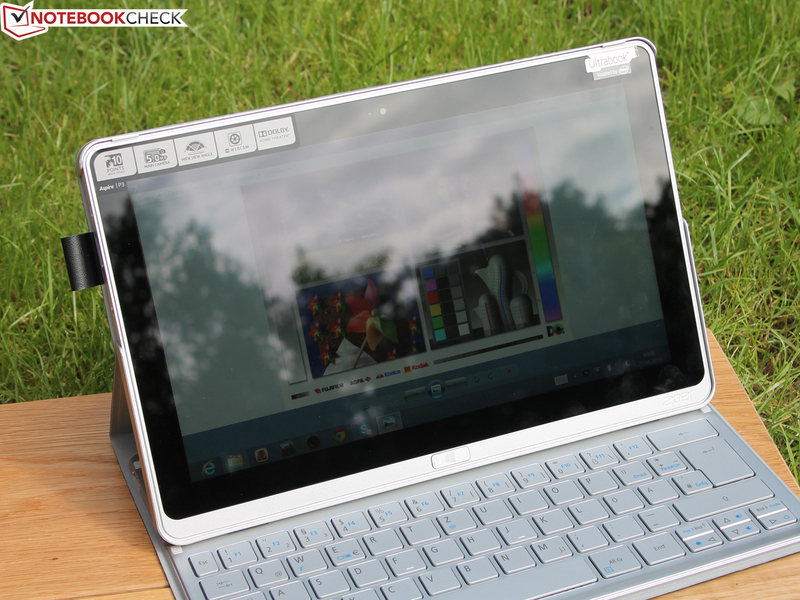 Samsung's ATIV Q now being released on the market could also be an alternative. with an affordable Windows tablet based on standard hardware. 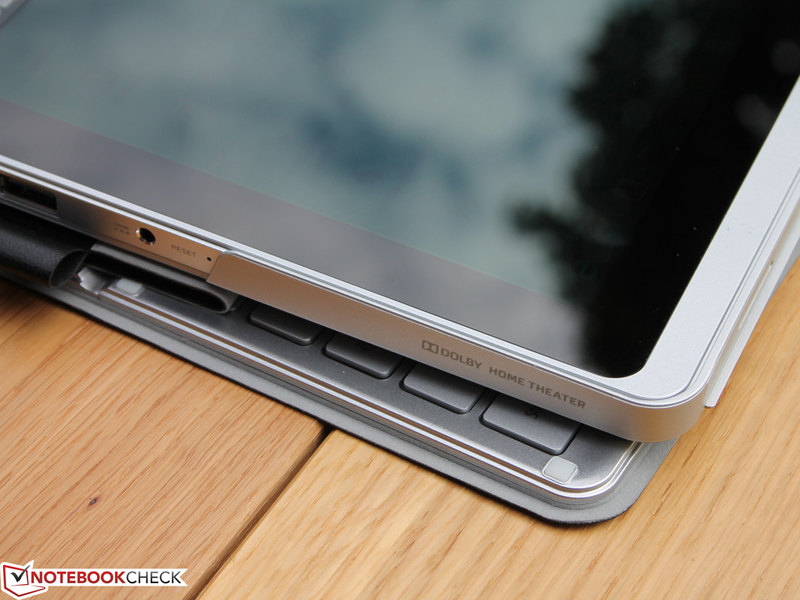 for ultrabook hardware in tablet format. 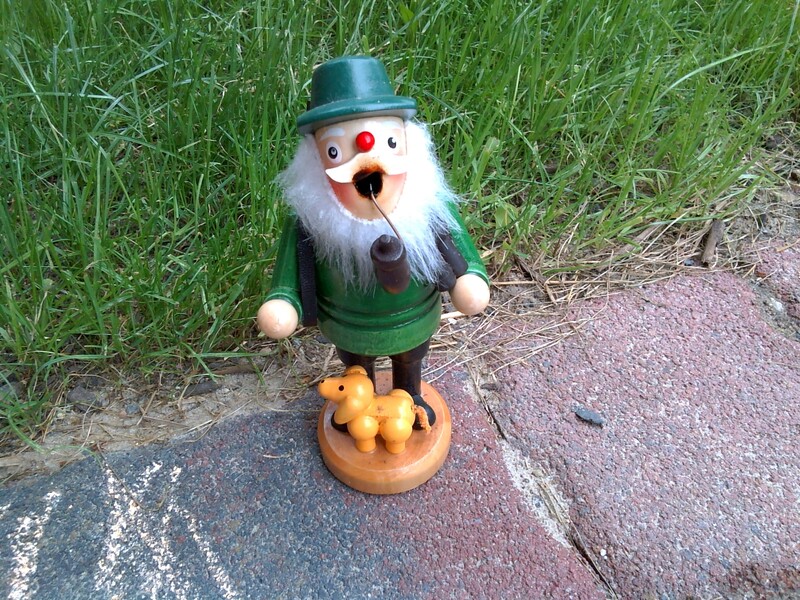 The current price of EUR 600 is luring. The keyboard belongs to the typical user scenario for the P3. But the P3 cannot be placed backwards in its case. as the Iconia W700, but a plastic keyboard case in silver (W700 = transparent). and the tablet sits securely over the keyboard. The speakers are located on the bottom edge. the keyboard's loose fit is annoying. The mechanical input device has a battery and connects to the P3 via Bluetooth. 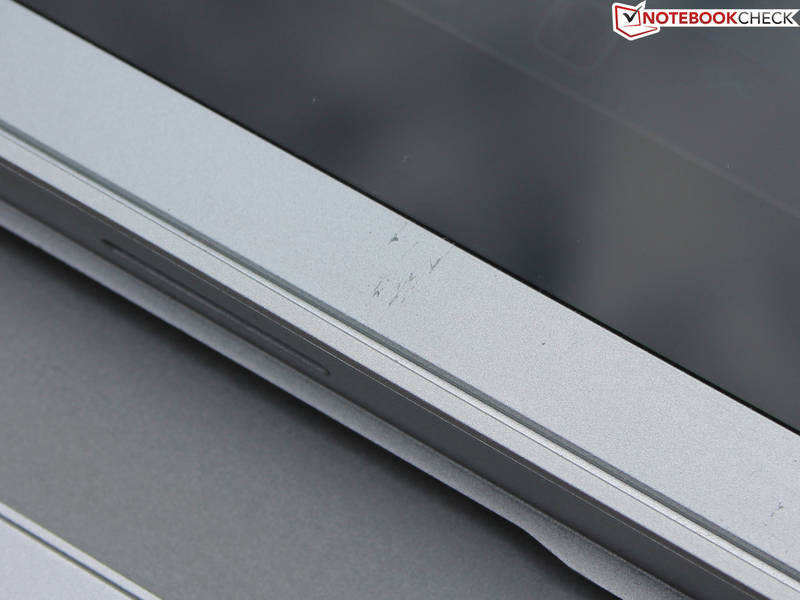 The tablet's movement over the keyboard quickly leads to scratches. 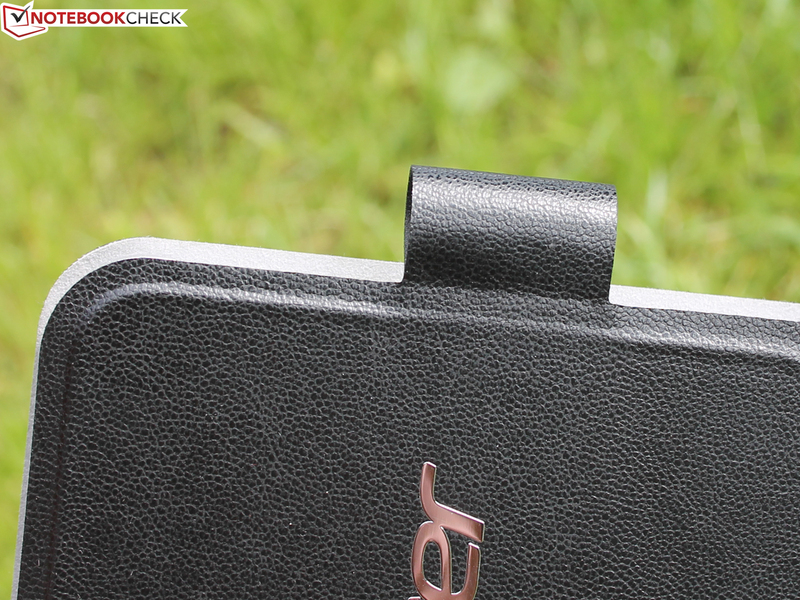 A stylus can be inserted in this strap. 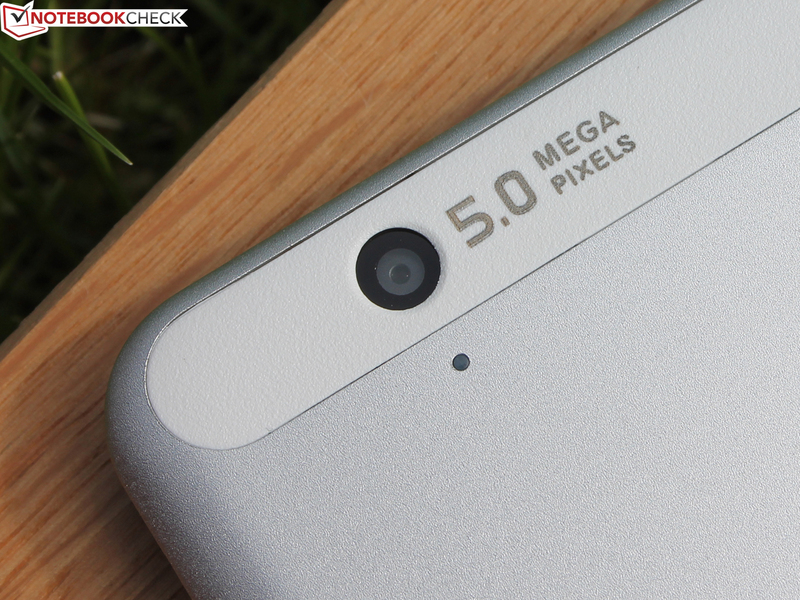 The rear-facing camera convinces with a high resolution and crystal clear pictures. The power supply and its cord only weigh 319 grams. 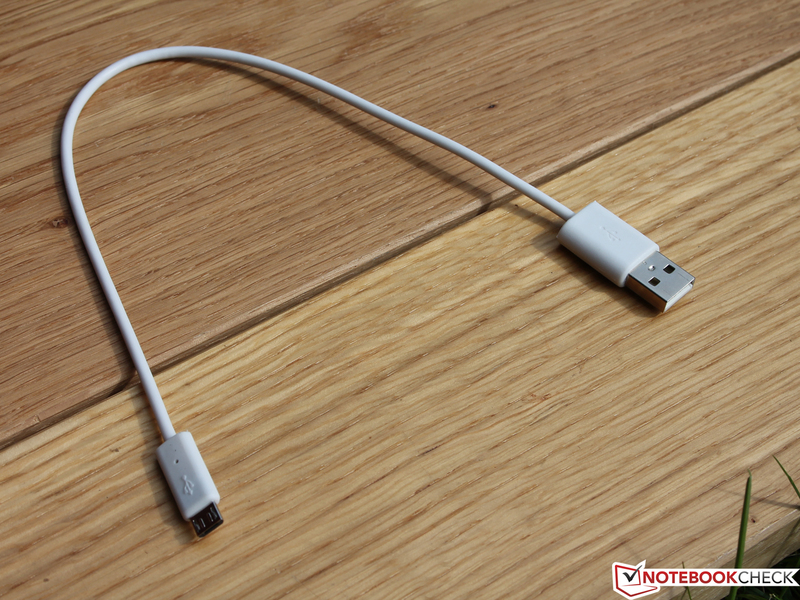 Accessories: The USB to mini-USB cable is used for recharging the keyboard. The IPS screen has a HD resolution and not in FHD (Iconia W700). A strong contrast of 1580:1 and a high brightness is pleasing to the eye. The box even contains a Windows 8 recovery DVD (2 data carriers. Acer Aspire P3-171: The installed speakers cannot meet the Dolby claim. 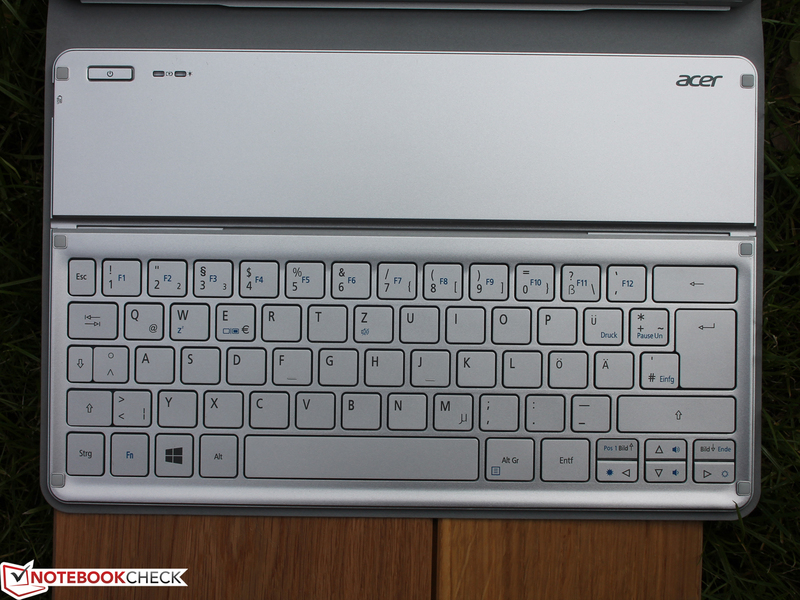 Acer Aspire P3-171: The keyboard is not optional, it belongs to the bundle. 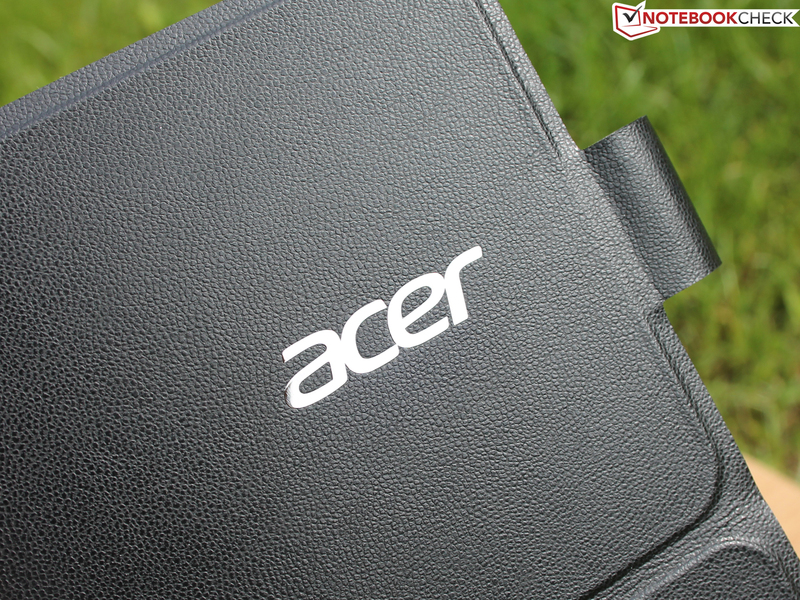 Acer Aspire P3-171: The case makes a solid, long-lasting impression. 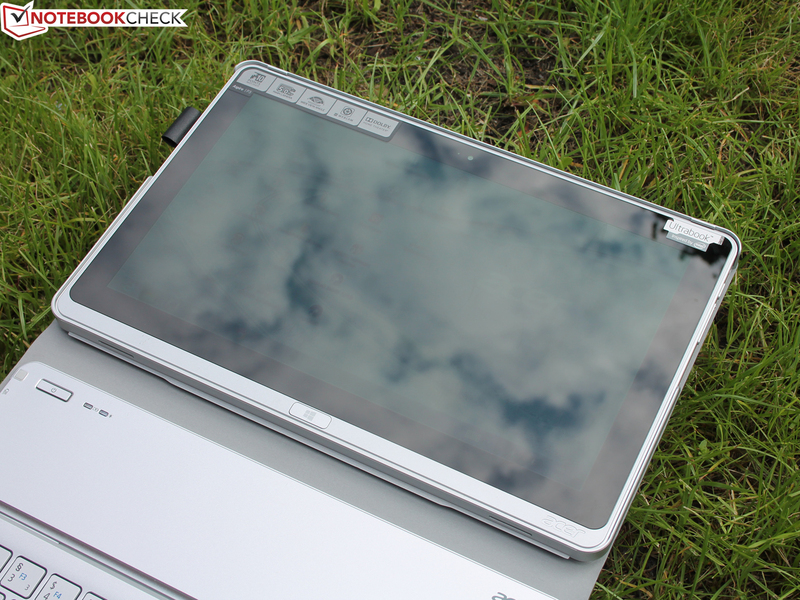 Acer Aspire P3-171: The IPS HD screen's contrast, brightness and viewing angles are awesome. 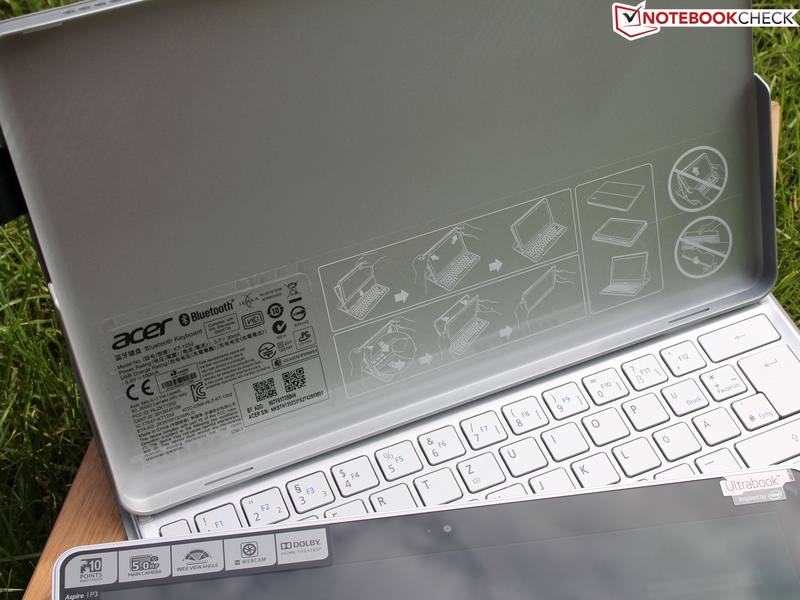 Acer Aspire P3-171: The overall idea is balanced. Switching from the keyboard to the touchscreen is quick and easy. Acer Aspire P3-171: The swift Intel SSD ensures good performance. 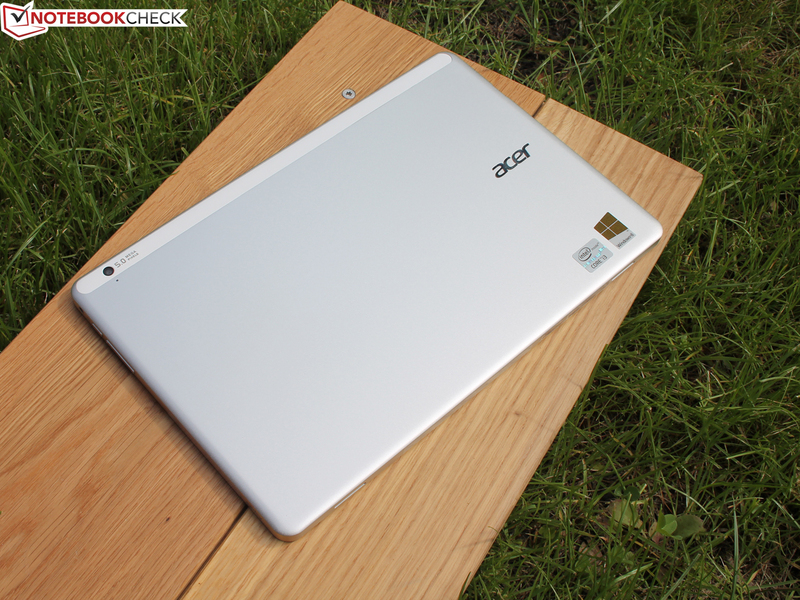 Acer Aspire P3-171: It is of course not the slimmest tablet. The necessary cooling capacity takes its toll. A viable idea with simplistic implementation. A Windows tablet for typing. We did not miss a touchpad because we soon got used to switching between keys and touch. 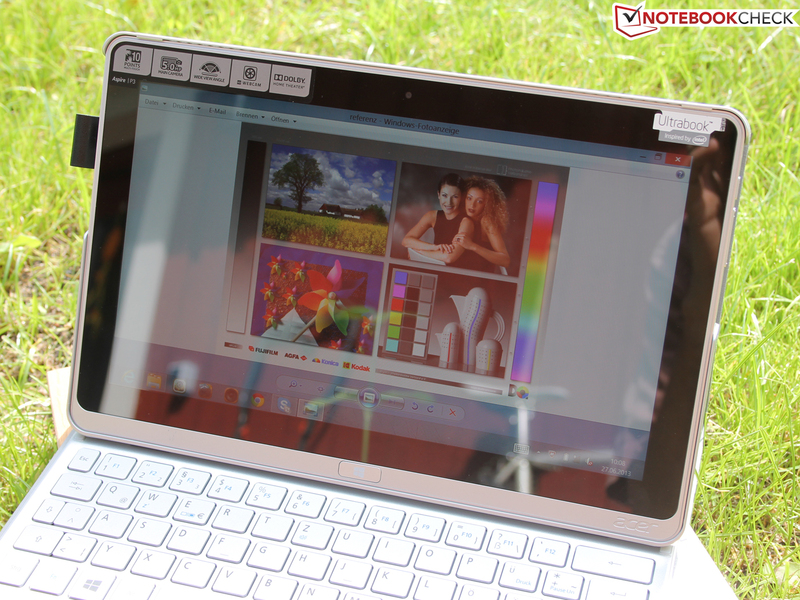 The perfect screen with vivid colors, high brightness and very good viewing angles. The good approach is lessened by the inferior keyboard. Regrettably, the system cannot be carried around in keyboard mode. Why is there only one sole USB port and no card reader? The slimmed Core i3 does a good job. 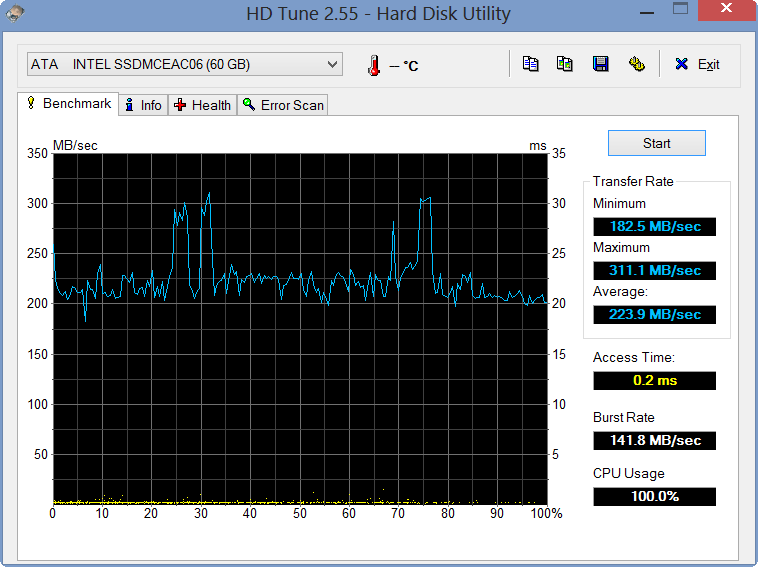 A decent system performance is achieved alongside the swift SSD, which can almost compete with expensive ultrabooks.